Introduction: In this article, Mary Harrell-Sesniak searches old newspapers to find some of the weird – and even dangerous – medicines our ancestors used to take for a variety of ailments. Mary is a genealogist, author and editor with a strong technology background. We’ve all got home remedies we depend on – but what about our ancestors? What did they do when a family member fell ill? Did they call the local doctor, or did they develop a soothing recipe, relying on their own home remedies? And even if they called the local doctor, did they receive effective medicine – or a quack “cure”? 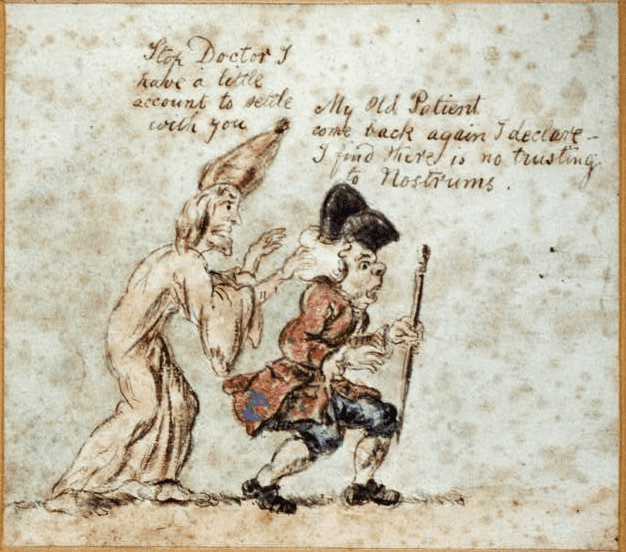 Illustration: quack doctor cartoon by G. M. Woodward (George Moutard), c. 1790-1809. Credit: Caroline and Erwin Swann collection of caricature & cartoon; Library of Congress, Prints and Photographs Division. Curious as always, I did some searches in GenealogyBank’s Historical Newspaper Archives for examples of home remedies, quack doctors and supposed cures. Some of the recommendations seem harmless enough – but let’s just say, that a few concoctions might even have hurt the sufferer. When the cure is worse than the disease it makes you feel fortunate that, over time, we’ve weeded out most of the quackery. 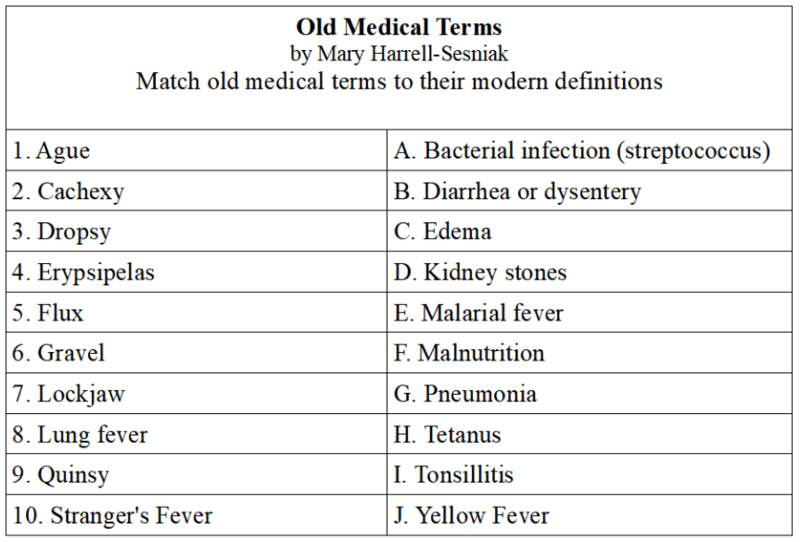 Before you begin reading these examples, take a look at this quiz of Old Medical Terms to see how many you recognize. The answers are provided at the end of this article. With any luck, one of our readers will recognize Frederick Herald in their family tree. His recipe to cure asthma was published in many newspapers. 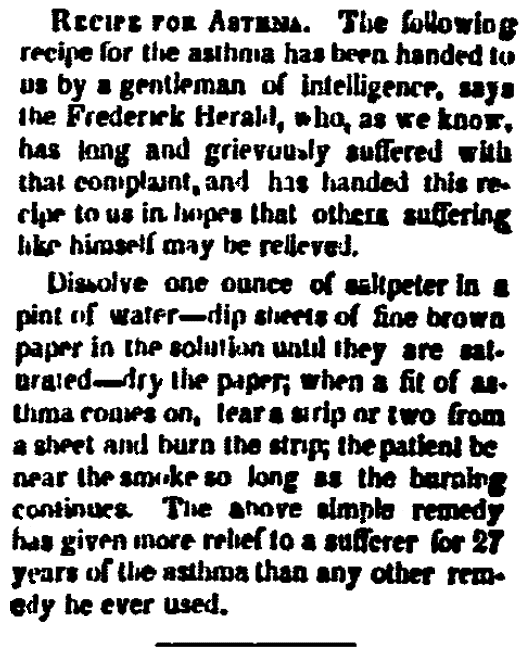 It consisted of brown paper dipped in saltpeter that was dried and later burned to help the patient breathe better. So, is saltpeter dangerous? Yes, so don’t try this “cure.” According to a Web search, potassium nitrate is harmful to swallow, inhale or even to absorb on the skin. I would imagine that the recommendation to fast to cure the common cold is more or less harmless, especially when forgoing “violent poisons” that others may suggest. 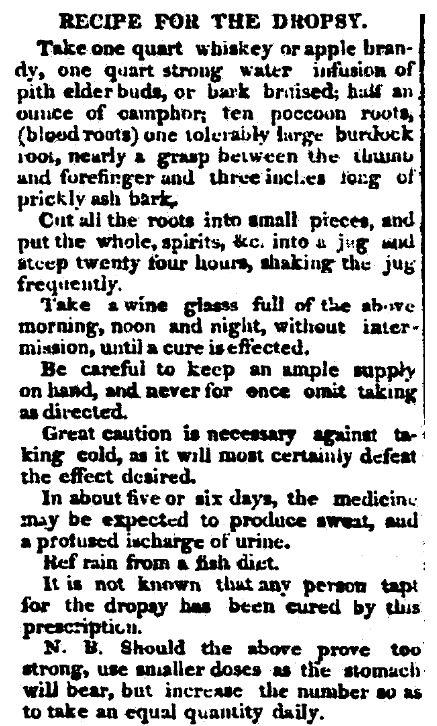 The author suggests this cure would be more effectual if you add copious water to the regimen. For the unfortunate sufferers of the dropsy, you could mix whiskey or apple brandy with water infused with elder buds or bruised bark. Add camphor and various chopped roots. Take it by a wine glass morning, noon and night – and after six days, you would begin to sweat and discharge the excess water. According to a brief search, it is not safe to consume camphor and you should take caution to not consume leaves and various chopped roots. Here is another remedy for dropsy which discredits historians who claim that electric shock therapy was invented in the 1930s. According to newspaper reports, it was used as early as 1821 when Joseph Odle of Odletown, Canada, was tapped 14 times. 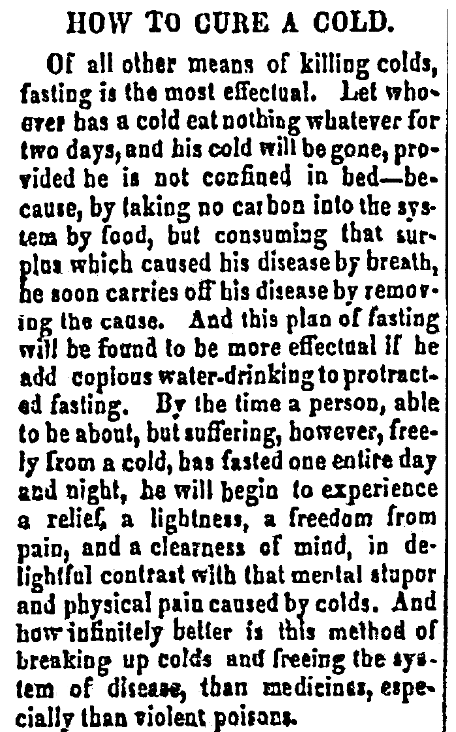 Believe it or not, the “medical electricity” cured his condition. Erysipelas has been described as a bacterial skin infection that may have been related to the streptococcus bacteria. 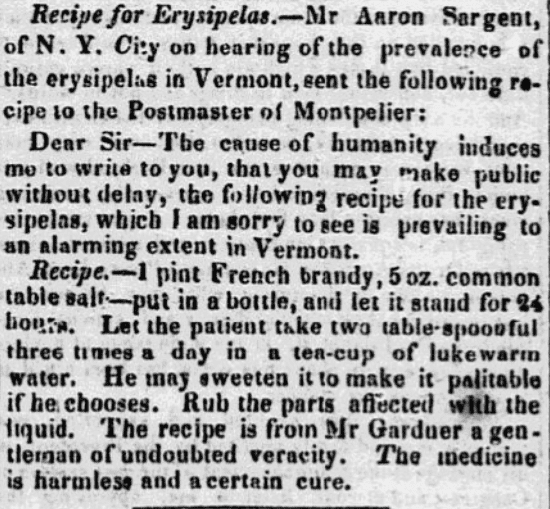 To cure it, Aaron Sergent of New York City recommended mixing French Brandy and table salt with lukewarm water, and to sweeten if desired. Not sure why you should sweeten it, as the recipe directs you to rub (not drink) on any affected parts. As noted, this was probably a harmless recipe. 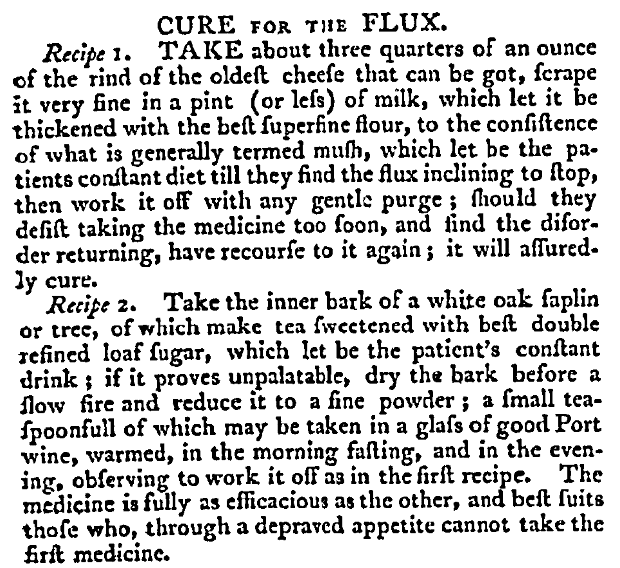 I’ll let you be the judge of these 18th century cures for the flux or dysentery. The first recipe consisted of using the rind from your oldest cheese scraped into milk and thickened with flour. The alternative used bark from a young white oak tree with port wine and was touted to be as fully efficacious as the other, and best for those who, through a depraved appetite, couldn’t take the other medicine. Note: Do not even think of trying this. The bark is reportedly toxic and could cause more flux and kidney damage. 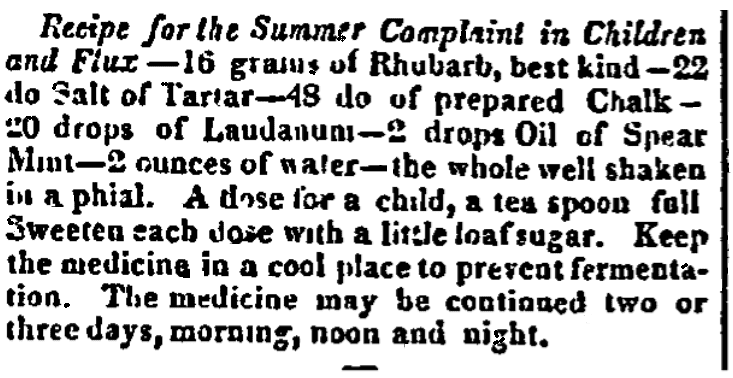 By 1825, we begin to see a new approach, and one that would make modern physicians shudder when given to children. Basically, you mix rhubarb, salt of tartar, chalk, laudanum, spearmint and water and take care to keep cool so it doesn’t ferment. Use 2-3 days, morning, noon and night. Add sugar to sweeten for children. Note: Laudanum is made from opium and shockingly is still available by prescription in parts of the world. 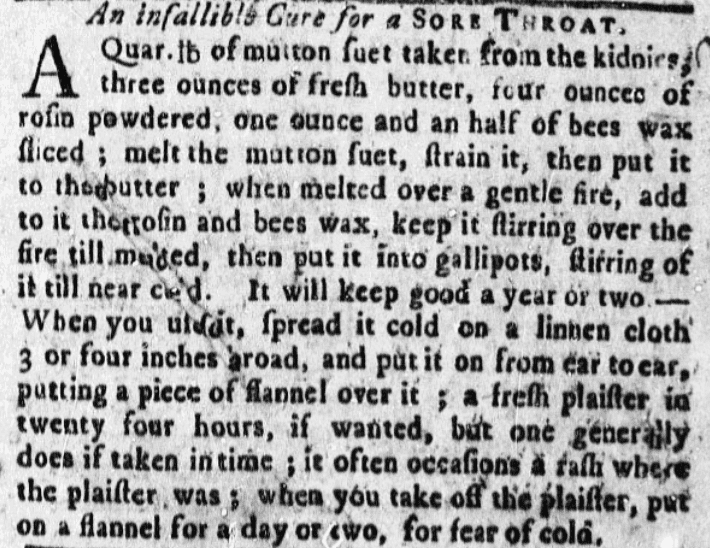 In 1765, if you had any spare mutton suet floating around, you were encouraged to mix it with powdered rosin and bees wax. The recipe was used as a compress and touted as an infallible cure for a sore throat. It had the added benefit of not spoiling for a year or two. According to several sources, rosin can be a skin irritant and may induce asthma or respiratory irritation. Read early recipes and have the family guess what the recipes supposedly cured. It could end up very funny! Match the disease to the modern definition. Create your own quiz (or feel free to use the one at the beginning of this article) for your guests. Note: You don’t have to limit yourself to ancient times to find quack cures. You’ll find enough material from any era, right up to modern times! 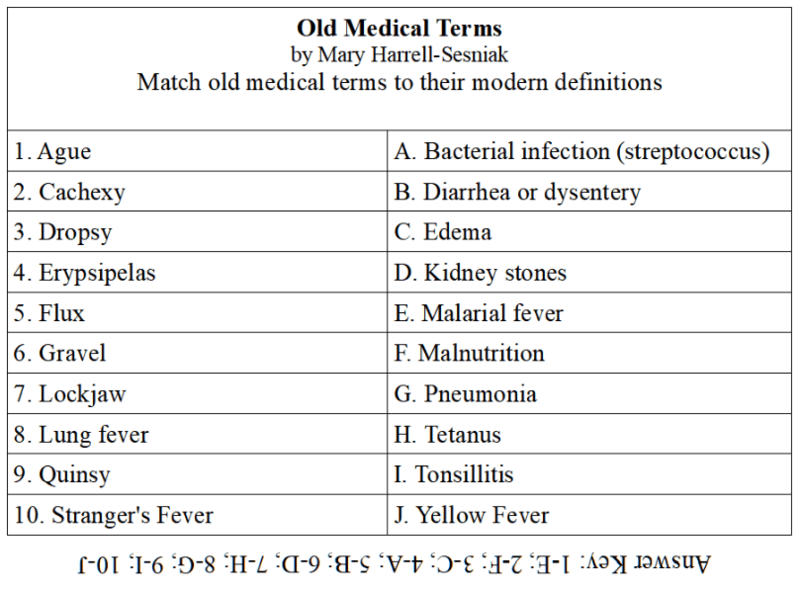 As promised, here is that Old Medical Terms quiz with the answers.